Finished this last night, cut the same sizes, 14 on top and 16 through the hips, as the gray non-stretch 2×2 rib I showed you last weekend. I shortened the sleeves one inch this time around. The fabric makes all the difference in the world in this pattern. This time I used a Malden Mills 2 way athletic stretch fabric and it is much tighter than I usually wear my clothes. I’ll have to get used to the feel of it. I think this fast and easy top will look good under a jacket or coat. 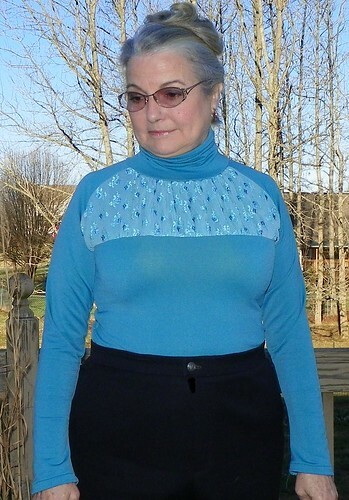 Posted in Pattern Reviews, Sewing and tagged Pattern Reviews. Bookmark the permalink. That is such a beautiful color on you. It looks pretty by itself, but will be super under a jacket also. Nice sewing! What an unusual idea. It will look lovely under a jacket or cardigan. And the colour really suits you.